Text in English and Italian. In a letter from London, dated 9 November 1815, Antonio Canova wrote: "...Here I am in London, dear and best friend, a wonderful city...I have seen the marbles arriving from Greece. Of the basreliefs we had some ideas from engravings, but of the full colossal figures, in which an artist can display his whole power and science, we have known nothing...The figures of Phidias are all real and living flesh, that is to say are beautiful nature itself." With his admiring words for the famous Elgin Marbles Canova, one of the last great artists embodying the grandiose heritage of the classical world, gave at the same time an appropriate description of his own artistic aims. 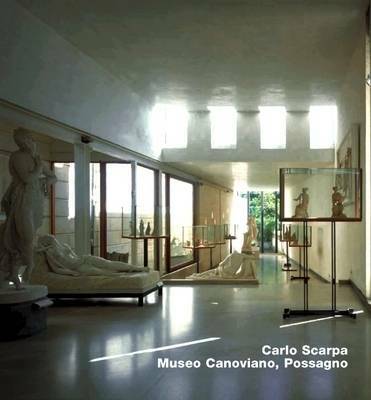 It was his half-brother who decided to assemble most of Canova's plaster originals and to place them in a museum he had built in the garden of his brother's home in Possagno, a small village north of Venice, where the artist saw the light of day on 1 November 1757. This basilica-like building erected in 1836 now holds the great majority of Canova's compositions.To commemorate the bicentenary of his birth, the Venetian authorities decided to have an extension added to the overcrowded basilica, and they commissioned the Venetian architect Carlo Scarpa for this delicate task. Scarpa composed a small, but highly articulated building that is in a strong contrast to the Neo-Classical, monumental basilica. The subtly designed sequence of spaces is unique even among Scarpa's so many extraordinary museum interiors as the architect was here in the rare position to compose the spaces as well as the placings of the exhibits. The placing of the sources of natural light which infuses the plaster surfaces with the softness of real life is in itself a rare achievement and it took an equally rare photographer to record such symphonies in white in all their magic.